Clear instructions and helpful tips will help you learn how to paint a car in a few steps. Even if you can't afford to buy a new car right now, you can give your vehicle a fresh new look. The way your automobile looks reflects on you. Whether you're shuttling your kids to school or taking clients out for dinner, having an attractive car can make a difference in the way people see you. However, professional paint jobs can be expensive. You can change your car's look with a little hard work and some careful planning. You'll also need a lot of patience, because this can be a time-consuming project. The task may seem overwhelming, but if you break it down into manageable steps, you'll soon be driving a much more attractive car. Before you get started on your project, you'll need to assemble the following supplies. You can rent the heavy-duty equipment, and most supplies should be available at your local hardware store, auto parts supply store, or home center. There are several steps involved in getting a good paint job, and in order to end up with an attractive look, you need to give each step the time and attention it requires. Go slow, and you'll end up with great results! First, it's important to get the vehicle ready for painting. Proper preparation is key to getting a good result, so don't skimp on this step. Clean the car very thoroughly to remove any grease, oil, or old car wax. Then sand down and repair any rust spots on the car. 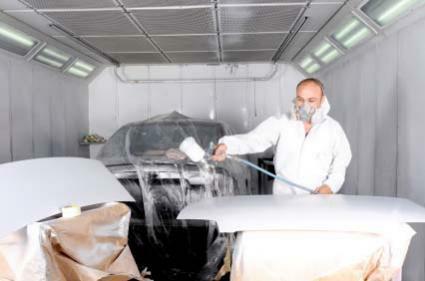 Next, sand the entire car to reveal the original coat of paint or the bare metal of the vehicle's body. Repair any dents with filler and allow it to cure completely before shaping. Clean the car again to remove dust and oil. Finally, remove any loose plastic or chrome trim pieces and cover windows and remaining trim with tape and paper. A good coat of primer acts as a foundation. It helps paint adhere to your vehicle and smoothes out any imperfections in the surface of your car.Apply an epoxy primer or self-etching primer to your vehicle. Pay special attention to small scratches and filled spots, since the primer can help give these areas a uniform appearance. After the first coat of primer has cured, sand the entire car again with 220-grit sandpaper. Apply at least one additional coat of primer and sand with 600-grit sandpaper. Finally, clean the car again to remove dust. Now it's time to start painting the vehicle. You can expect this step to take some time, but if you are methodical and meticulous, the result should be very rewarding.Read the instructions on your painting equipment and on the paint itself. Follow these instructions when you mix the product. A catalyst can help provide a harder surface. Make sure the entire car is perfectly clean, and then lightly spray it with paint. Use multiple coats or a base and top coat to avoid drips and other imperfections in the surface. It may take up to seven days for the surface to cure, and during this time, it must be dust-free. A clear coat will help protect your work, and it will provide a higher-gloss appearance. This step is not necessary, but it goes a long way toward giving your car a professional look. Before applying the clear coat, sand the car again. Use 1200-grit wet sandpaper to remove any small imperfections in the paint. After sanding, ensure the surface is clear of dust and oil. Apply the clear coat. After it has cured, sand a final time with 1500-grit wet sandpaper. Then buff the car carefully to bring out the shine. Keep safety in mind at all times. Wear protective clothing, goggles, and a respirator to protect yourself from dust and fumes. Check local regulations before undertaking a project like this one. There may be restrictions about spraying paint. Be patient. There are many steps involved in this project, and the entire process can be very time consuming. It can take a month or more to complete the task, so be prepared to take your time. Read all instructions for your equipment and supplies. The manufacturer is the best source for information about paint and paint sprayers. Keep the car and the area around it clean at all times. Grease and dust are the enemies of a good paint job. Most of all, remember to have fun and enjoy the process. Soon, you'll have a beautiful automobile that will turn heads!